What she found proves that those of us with MCS/ES aren’t crazy malingerers, and indeed, should compel everyone to demand laws that provide complete and meaningful info on labels, and that health protective laws and regulations be enacted for everyday products and materials. While most of the hazardous VOCs she detected are due to fragrance chemicals, she also discovered that fragrance-free laundry products, even “green” ones, emit known, hazardous air pollutants, including some known to cause cancer. 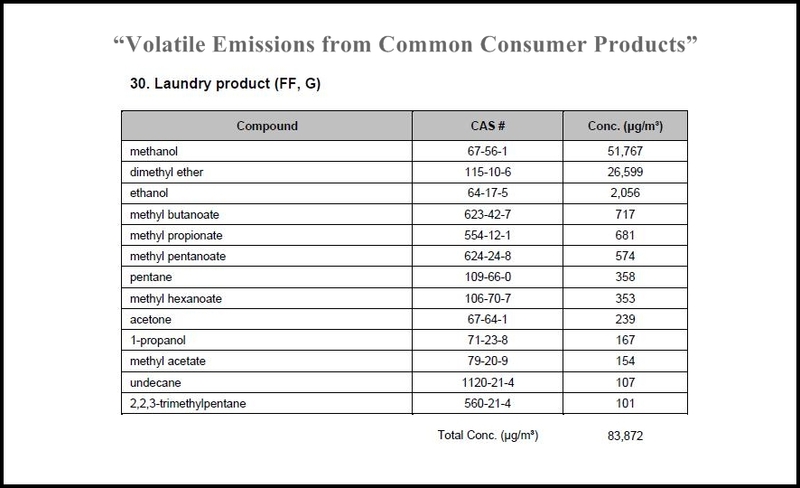 The most prevalent VOCs in these 6 fragrance-free laundry products were ethanol, acetaldehyde, methanol, and undecane. 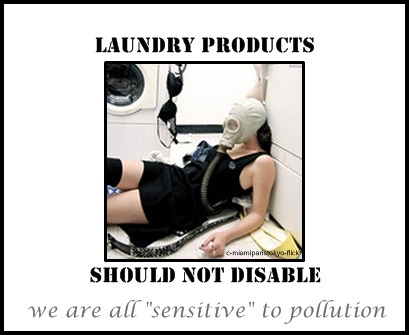 Why are these hazardous pollutants even in fragrance-free laundry products??? When we use (any) laundry products, we breathe them in and have 24/7 contact with them against our skin, as they are not all washed out in the rinse cycle, and dryer sheet chemicals aren’t washed out at all. Shouldn’t these residues be harmless, not hazardous? Most important hazard(s): Xn – Harmful. R 36/37/38 – Irritating to eyes, respiratory system, and skin. R 65 – Harmful: may cause lung damage if swallowed. S 02 – Keep out of the reach of children. S 26 – In case of contact with eyes, rinse immediately with plenty of water and seek medical advice. S 62 – If swallowed, do not induce vomiting: seek medical advice immediately and show this container or label. R 11 – Highly flammable. R 36 – Irritating to eyes. R 66 – Repeated exposure may cause skin dryness or cracking. R 67 – Vapours may cause frowsiness and dizziness. S 09 – Keep container in a well-ventilated place. S 16 – Keep away from sources of ignition – No Smoking. It’s not the smell, it’s the chemicals! Should you wish to do further research regarding known (published) health effects from the substances above, please let me know so I can link to it here too. -material safety data sheets do not need to list all ingredients. -the disclosure of some chemicals, but not all chemicals, on product labels and MSDSs may lead consumers to presume that they are seeing all ingredients. In other words, the current laws and regulations are not protecting our health. products, are not disclosed anywhere. 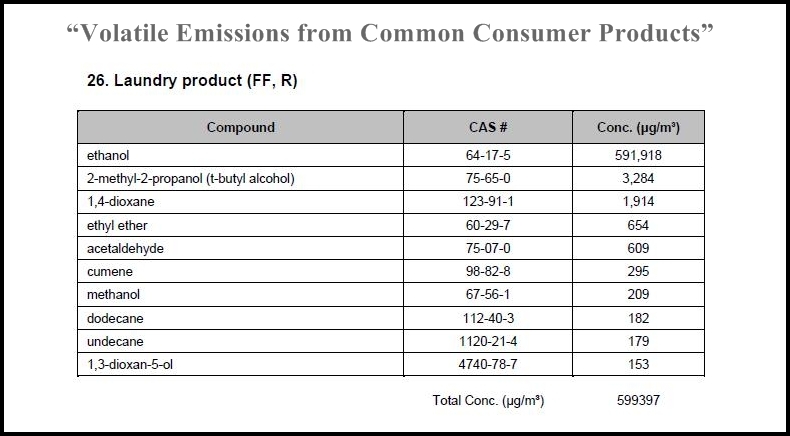 When our health IS adversely impacted by these product ingredients, WE are the ones who have to pay the costs, while the polluters keep the profits. There are environmental impacts too, as these chemicals impact not only our air, but go down the drain into our waterways, affecting wildlife and our drinking water. Municipalities don’t filter out many of the chemicals that go down our drains, so unless we install expensive water filtration systems, we will be consuming many of these (and other) substances again, and again. What do you use to clean your laundry? Remember that 2 of the fragrance-free laundry products were regular and 4 were green. This study focused on VOCs, but other types of product emissions also need to be analyzed, such as semivolatile organic compounds and ultrafine particles. 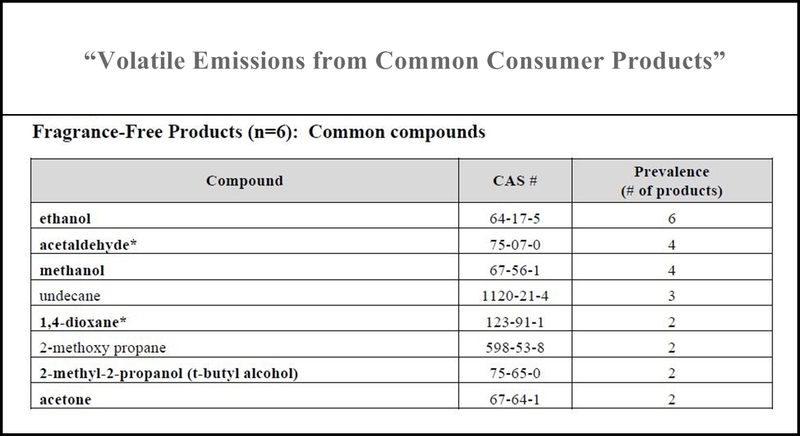 In the full study, you can also find “Comparisons of Fragranced and Fragrance-Free Versions of Regular Laundry Product Brands”, as well as all the other VOC info, some of which I shared here. Please share your favorite non-toxic laundry methods in the comments below. Our clothing and bedding should be safe to live in. This entry was posted in Air Quality, Chemicals, Environment, Health, MCS/ES, Pollution, Public Health and tagged allergies, asthma, carcinogens, chemical pollution, chemicals in laundry products, cleaning, confusion, dizziness, essential oils, fire hazard, fragrance-free, green, hazardous air pollutants, headaches, laundry, non-toxic, Products, rashes, toxic. Bookmark the permalink. I use Bob’s Red Mill Baking Soda with a little Seventh Gen laundry product for the wash cycle and sometimes add organic white vinegar for the rinse. I use baking soda and Seventh Generation Laundry soap in the wash and white vinegar in the rinse. Thanks for this article. I just commented on my blog about walking in the woods. The trail goes near an apartment building and the fragrance from laundry products being released from a dryer vent filled the woods for a significant area. I had to leave my nature walk because the chemicals in the air from laundry products was too toxic to stay. I started using “BioKleen” products recently. Now I have to check on it. I Use seventh generation free and clear for the wash cycle and arm and hammer baking soda for the rinse cycle. I would love to know which products she tested, but it’s unlikely that will be disclosed. I know I have had issues with several of the “green” ones over the years, but they were usually lesser issues than the brand names, although any symptoms are too many as far as I am concerned!. Tide Free for instance was and is just as disabling as any conventional fragranced product, as are the fragrance-free dryer sheets. This study compares some of the popular brands to their own fragrance-free brands and shows that the problems are still huge! I used to be able to use soap flakes and Marseilles or olive oil soap but I think commercial lye is chemically contaminated these days, as I don’t tolerate any soaps now, even those made with organic oils. If I had a machine, I think I would be able to use a liquid “green” f-f laundry product in the early detox process, but it would have to be thoroughly washed out. I can be around people who use some of the “green” liquid f-f products if they’ve been well washed out. (1 rinse does NOT wash out laundry products, even 2 rinses are not enough). The “green” powdered versions are still a big problem for me. Many DIY recipes suggest using FELS soap… Please don’t. It is just as problematic as any other commercial soap or detergent, and also contains fragrance chemicals… Please don’t waste your time. IVORY either, as it contains fragrance chemicals. READ labels, even though they don’t tell the whole story. Greenwash and (mis)leading statements about safety being of utmost importance to them is rampant, actual ingredient details are extremely hard to find, and as mentioned above, many are not listed anywhere. Don’t believe anything without asking more questions. Many people believe they are making good soaps and detergents but they have never examined the life cycle of their ingredients, they just assume they are safe because they meet (nonexistent) regulations. Changing our products over to the safest possible can sometimes be a slow process, taking place over years. Getting away from the most toxic ones asap is key. Hopefully someday, if there’s enough public pressure on the manufacturers AND on the law makers, we won’t have to be choosing from the lesser of evils, but will have more options to choose from that are all good. Did u give up on getting washing machine? My kidneys are giving up on me, have u heard of MCS pl dying of renal failure? I know of one on the mcsbeacon of hope site. My liver is not happy either. I know its from the chemicals but my MD is aguing with me. He wants me to take more pills. Big surprise ….. The washing machine is in limbo – I don’t have anyone to detox new machines for me and I can’t have them delivered and detoxed here. I’m sorry about your kidneys, mine aren’t in the best of shape either, and I’ve had trouble with them since before the MCS became disabling. Only alt health practitioners picked up on it, long before I had any symptoms even, the regular medical practitioners were clueless when I went to them for help. 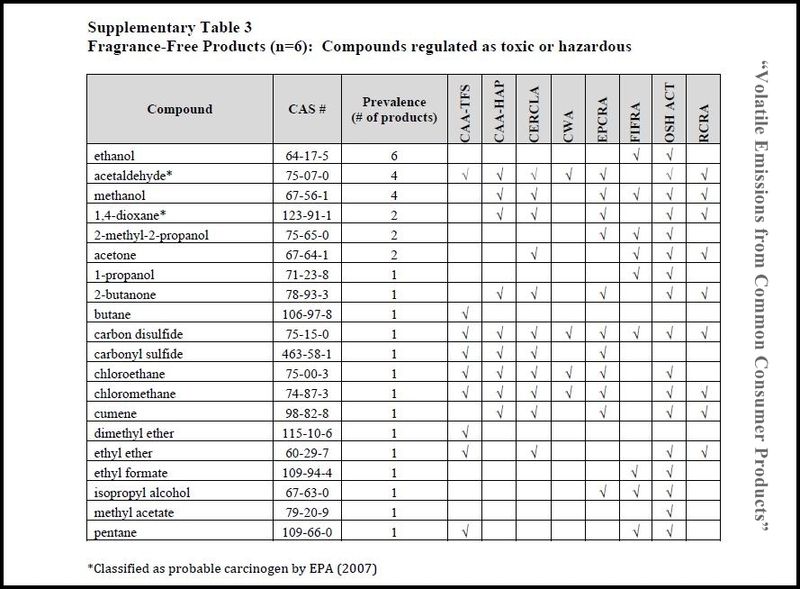 If I remember correctly (if I am wrong, someone please correct me) Shaklee uses chemical fragrances and there were other concerns, possibly non-disclosure related, but it has been a while since I looked into it. Regarding GMOs and another commonly used laundry and cleaning product, HEINZ uses GMO corn to make their vinegar in the US. I can use Charlies Soap. It’s a liquid, expensive but worth being able to breathe. Please rinse more than once to remove more laundry product residues. Wool dryer balls are a great option. If you have synthetic clothing, take them out just before they get totally dry to avoid static build-up. Adding harmful chemicals to our clothing and bedding, our water and the neighbourhood air, only benefits the chemical industry and their profits while adding to increasing health care costs and higher taxes for people (not industry, they get the tax breaks). I may have MCS or dermatitis. Some kind of skin condition that’s for sure. I have tried various detergents, fragrance free or not. I have thought about visiting an allergy doctor, but I would have to pay $500 up front before my insurance kicks in. Meanwhile, insurance claims that they don’t know where the $500 is coming up. Seeing a specialist should only cost $75. I now have to call the doctor back and see what’s up. Otherwise, I go to someone else. They want to apply patches to see what I am allergic to for one week. I can’t shower at all. I personally haven’t done any patch testing, but some people have been helped a lot, others not so much, as it doesn’t necessarily identify the chemical compounds that are problematic. Changing our diet to whole foods and organic, doing elimination diets to see if there are foods contributing to the problems, avoiding processed foods, especially GMOs as those are heavily pesticided, using filtered water, choosing simple, natural, non-toxic products, (ie avoid things with more than a few ingredients and preservatives), watching what else we have in our air space, can all make a difference. Some people find using soap nuts for laundry makes a difference too.